In stark echo of Jewish experience, thousands of Syrian Armenians returning to homeland to escape civil war, persecution. (AFP) When a bomb destroyed his workshop in war-ravaged Syria, silversmith Levon Keoshkerian followed other Armenians heading with a heavy heart for their ancestral home in the Caucasus. He now lives with his elderly mother in Yerevan, where he goes every morning to the outdoor flea market to sell the silver ornaments he rescued as he fled the divided city of Aleppo. "All my life I worked to preserve and develop the ancient craft of Armenian silversmiths," said Keoshkerian, 47, who came to the Armenian capital in 2015. "Now I have returned to the blessed land where the tradition was born." His silver plates, chalices and jugs were crafted in Syria, but they are decorated with traditional Armenian motifs: birds, grapes and pomegranates. 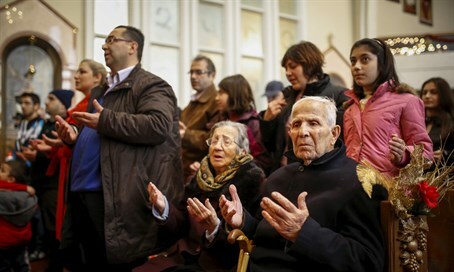 Keoshkerian and his elderly mother are among some 18,000 members of the Syrian Armenian community who have resettled here since civil war broke out in Syria in 2011. "For a long time we didn't want to abandon our house and flee. We kept hoping that life would go back to normal," Keoshkerian said. "But after a bomb fell right on my workshop, we understood that we could not wait any longer." The craftsman drove his mother through Turkey and Georgia to Armenia, braving a difficult journey after Islamist fighters in Aleppo forbade him from selling silverware embellished with pictures of animals. "Our trip to Armenia was no safer than living under constant bombing in Aleppo," Keoshkerian recalls, citing shelling on roads, militia attacks on buses and harassment by Turkish border guards. "But finally, my mother and I found safety here in Armenia, where we must start a new life from scratch." When war broke out in Syria, it was home to a small community of 60,000 to 100,000 Armenian Christians, many of whom lived in Aleppo. Syrian Armenians were "long-established and law-abiding Syrian citizens - wealthy merchants, craftsmen, doctors," said Firdus Zakaryan, head of an Armenian diaspora ministry commission overseeing the recent arrivals' integration. "They preserved the Armenian language and traditions, which helped them adapt to a new life in Armenia," he said. The Armenians are a small part of the tide of people fleeing Syria's war in one of the worst refugee crises in modern history. Almost half of the country's population of nearly 25 million have been displaced, and four million people fled to Turkey, Lebanon, Jordan and Europe. Home to three million people, the ex-Soviet republic of Armenia has become home to the world's third-highest refugee population per capita, according to the UN refugee agency. But Syrian Armenians fleeing war today mourn the fact that their ancestors were themselves survivors of the Ottoman Turkish massacres during World War I - meaning their community has suffered displacement twice in just a century. Armenian authorities have taken measures to make it easier for Syrians of Armenian descent to seek shelter here, including a visa waiver, but the impoverished country is struggling to cope. "The government has simplified the naturalization process, covered their health insurance costs, allocated educational funds and even subsidized housing until at least one family member finds a job," Zakaryan said. "But our small country can't shoulder the burden alone, we need international financial assistance." The UN refugee agency is helping Armenia establish a microcredit scheme to help refugees set up businesses. "We run courses to familiarize Syrian refugees with Armenian laws and tax regulations and provide those who plan to set up a small business with working tools and equipment," UNHCR coordinator Anahit Hayrapetian said. In a sign the community is eager to integrate, many Syrian Armenians have opened car service stations, bakeries and tailors' shops in Yerevan and other cities, Hayrapetian said. "Dozens of new Syrian restaurants and cafes have transformed Yerevan's culinary scene," she added. Salbi Jabakhchuryan and her son Kaits who came from Aleppo in 2012 run one of Yerevan's most popular restaurants, located right in front of the seat of government. While their mastery of Armenian cuisine has been key to their success, they have had to tone down some of their recipes to adapt to local tastes. "In our two restaurants in Aleppo, we used to cook hot and spicy dishes, but Armenians prefer milder food," said Kaits, 28, pulling a freshly baked lahmajoon - a thin, crusty bread topped with ground meat - out of the oven. "So, we adjusted," he shrugged. "In Syria we lived a hundred times better than here, we were respected, but here it is safe and nobody will hurt you just because you are Armenian," his mother said. "When we left Aleppo, we shut the doors of our house, but we kept the keys - just as our ancestors had when they fled Turkey during the Armenian genocide in 1915."